Chemistry student in an undergraduate teaching laboratory carrying out a titration experiment. 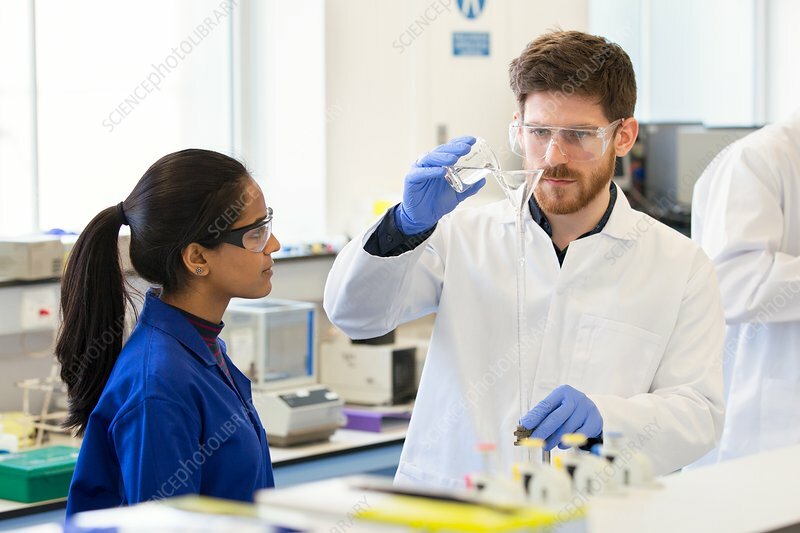 A student is filling up a burette with an acid or base solution at eye level using a glass funnel and beaker, whilst a postgraduate lab supervisor or demonstrator (wearing a blue lab coat) watches on. Titration involves the addition of an acid to a base, or vice-versa, with a burette (vertical apparatus) used to measure the volume of a known concentration added to a known volume in the conical flask. Colour changes in the indicator used show when the mixture has reached a neutral pH. This then allows known and measured volumes and the known concentration to be used in a calculation of the unknown concentration in the conical flask.